If you have access to the restaurant Kale Me Crazy then you must try their chicken pesto wrap! We had it on a gluten free wrap and it was delicious!! I thought we HAVE to recreate this. And we did and honestly, I have to say, I think our version turned out even better. And it was a lot cheaper! Tate literally slapped his hands together after he ate this dinner and said “done in record time!”. And, while I don’t advocate eating quickly (althought he typically is the slooooowest eater), I will take that as a compliment to the meal. He loves it but we all do. This is our new favorite meal! With our creation, we decided to use grilled chicken instead of sliced deli meat. And while their gluten free wraps were really good (they use Food for Life rice tortillas), we used our favorite Siete tortillas (the same ones we use for our enchiladas – see picture in post). But since the Siete grain free tortillas are smaller we made quesadillas instead of wraps. For the pesto, I was able to make it dairy free (I think KMC’s) has some parmesan. And, I was also able to make it nut-free using my favorite pumpkin seeds. Anyway you could easily just buy some of your own pesto but I love it fresh and really it doesn’t take more than 5 minutes to make. And it’s sooo worth it!! Sometimes you gotta mix the pics up and it’s been awhile since I’ve used my kids in the pics. They are getting so old! Alice just told me a few minutes ago that she will be doing a Drivers Ed course this summer. That just about blew my mind. Anyway, the reason I got this picture is because she actually volunteered to “hold the plate”. 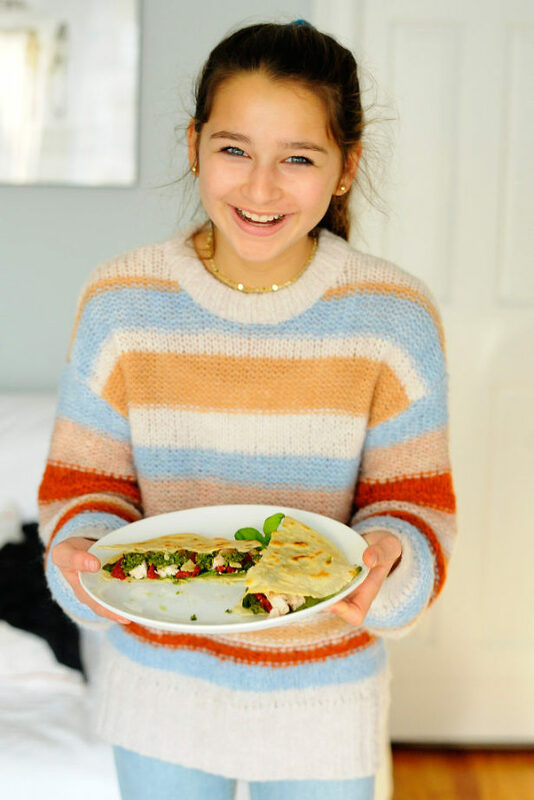 Needless to say, I got this snapshot before she devoured the quesadilla!! 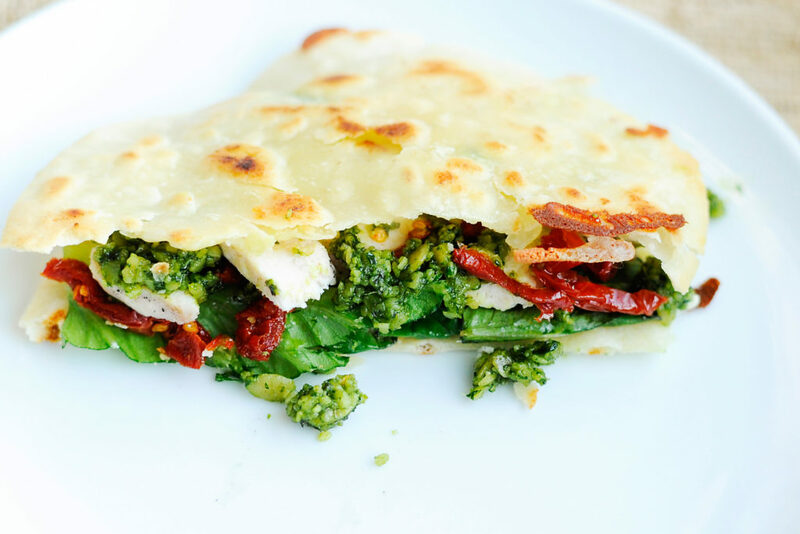 The pesto is what really makes this wrap, I mean quesadilla. 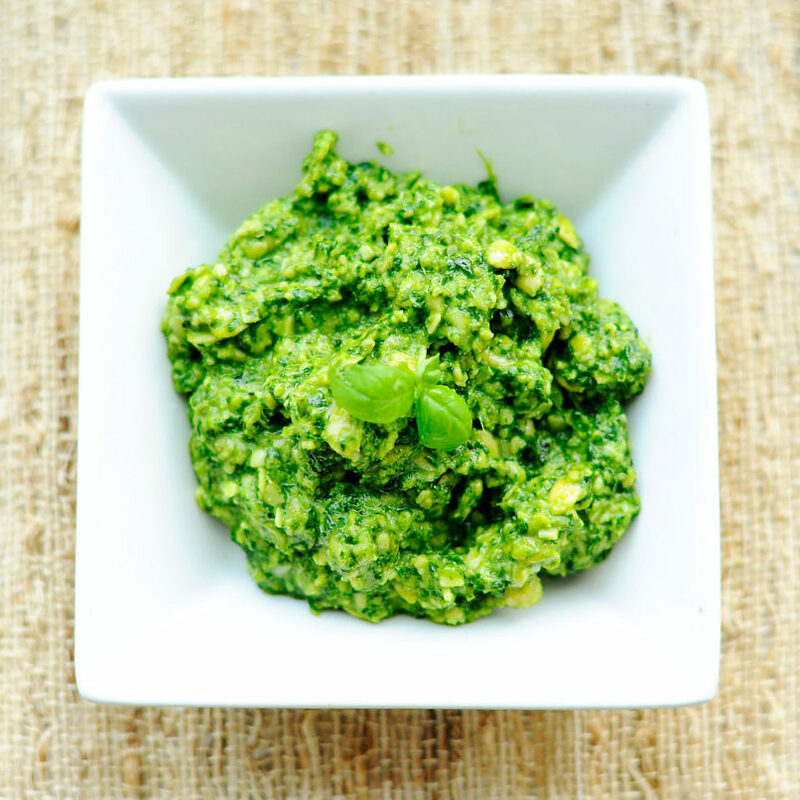 But after making it twice last week (yes, we had this dinner two times last week since my hubby grilled so much chicken the Sunday before anyway), I am realizing that I need to put this pesto on everything. Just this morning, I added some to my breakfast mash it was awesome!! I tend to munch a lot when I am cooking. I mean, don’t we all? Anyway I thought this (below) was delicious just this way. What a great little appetizer this would make! By the way, does anyone have an air fryer? I hear people love them and use them every single day. I got one for Christmas but haven’t had a chance to try it yet. I am excited to try all kind of veggies, buffalo wings, and chicken parmesan with it. I would love to hear your experience/recipes if you have one! Take your grilled chicken (rotisserie chicken or deli slices chicken) and cut it into long thin slices unless it's deli meat. Heat a large frying pan onto medium heat and add 2 tsp of butter. Add 2 tortillas (and sprinkle cheese on it if desired) and cook until brown. Place the cooked tortilla on a plate, add the chicken, sun dried tomatoes and lettuce. 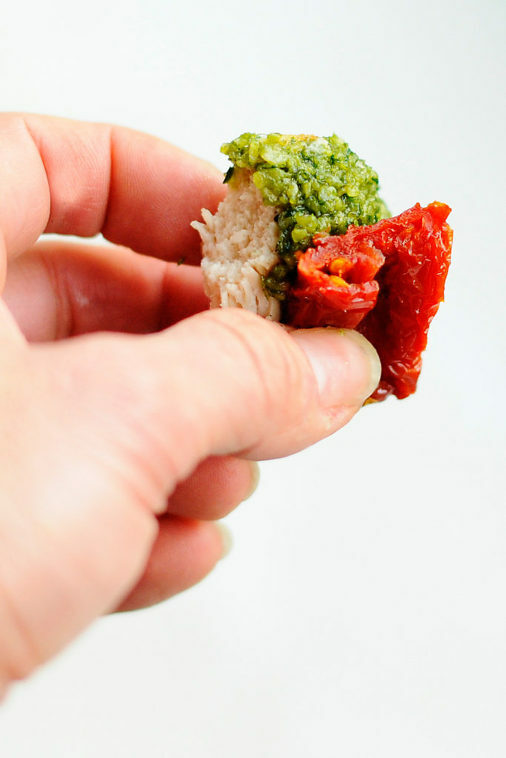 With the other tortilla, coat it with pesto and then place it on top of the tortilla with the chicken. Use a pizza cutter to cut twice through the middle and enjoy!